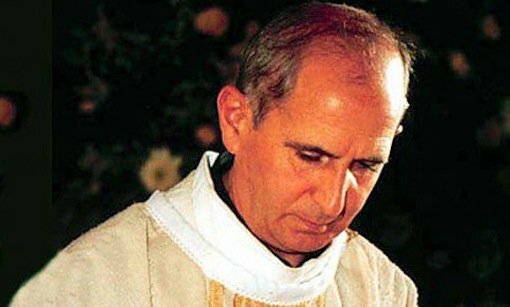 On May 25, a mere twenty years after his murder, the Italian Catholic priest Don Giuseppe Pino Puglisi will be beatified. A figure much beloved in Sicily, Puglisi will be the first victim of the mafia to be declared a blessed by the Catholic Church. Puglisis beatification is a sign of how a Church once deeply complicit with organized crime came to stand heroically against it. A native of Brancaccio, perhaps the roughest and poorest neighborhood of Palermo, the young Pino Puglisi was exposed to the dangers of the mob since being ordained a priest in 1960. His first assignment was a village called Godrano in Sicily. In this hamlet of only about one hundred people, fifteen villagers were killed by the mafia near the time of his arrival. Puglisi responded by going door to door to preach reconciliation and forgiveness of ones enemies. Much of the Sicilian Church neglected the danger of the mafia. The archbishop of Palermo, Cardinal Ernest Ruffini, regarded organized crime as something of a myth blown out of proportion by the media to deflect from the true threat to Italy, communism. In one interview, Ruffini told a journalist that he was not sure whether the mob even existed. Perhaps, he suggested, it was the product of the medias fantasy. This compelled Puglisi to pressure Church authorities to speak out against the mafia. When Puglisi returned to Brancaccio as the pastor of St. Gaetano parish in 1990, he became one of organized crimes biggest opponents. Puglisi railed against the violence of the mob on Sunday mornings, and his Masses attracted increasingly large crowds of Sicilians who felt that finally someone was speaking in defense of their rights. However, perhaps as important as his strongly worded anti-mafia homilies were Puglisis efforts to create an anti-mafia culture: his parish became a center of resistance to Cosa Nostras corrupt rule. Puglisi encouraged his flock to stand up and defend itself against the ever-powerful mafia, thus breaking with many Sicilians previous practice of omert , or taking a vow of silence in light of the mafias anarchic violence. Puglisi realized that poverty, ignorance, and idleness breed crime, and so he encouraged Brancaccios youths to stay in school and tried to structure their free time. He created a soccer field on the territory of his parish for young boys to play rather than be seduced by Cosa Nostra, and he encouraged many of his young parishioners to be altar servers at his Masses. Puglisis courageous stance against the mafia signaled a strong break with previous Brancaccio pastors practices. Whereas his predecessors at St. Gaetano grudgingly accepted the influence of the mafia, Puglisi refused money from Mafiosi. However, like many great Christian witnesses courageous enough to deplore injustice, Don Puglisi paid the ultimate price. On September 15, 1993, his fifty-sixth birthday, Don Puglisi was shot and fatally wounded in front of St. Gaetano parish, his assassination ordered by the mafia. Puglisi quickly became a legend to many Sicilians. Graffiti with Puglisis favorite phrase”And what if somebody did something?”is spray painted all over Palermo. In 1999, Puglisis beatification cause was inaugurated, and in 2013 he will be beatified, much to the joy of many Sicilians. After turning a blind eye to the mafias sins for centuries, the Italian Church, like John Paul II, in recent years has become perhaps the mobs most vocal critic. In the 1980s, Archbishop of Palermo Salvatore Pappalardo became the first cardinal to publicly denounce the mafias culture of violence, representing a strong break with the stance of his predecessor Cardinal Ruffini. At the same time, many Italian prelates called for the excommunication of convicted mafia leaders. In 2010, Bishop Luigi Renzo of Vibo Velentia in Calabria asked all his priests not to tolerate the participation of Mafiosi in Corpus Christi processions, a practice commonplace in Sicily that until recently the Church ignored. For many years, prelates tolerated morally questionable leaders for reasons of convenience. Yet Vatican II, which so eloquently spoke of the Churchs need to defend the poor and vulnerable, encouraged the Church worldwide to stop thinking of its short-term privileges and fight for a more just society. One is reminded of the Churchs instrumental role in bringing down communism in the former Eastern Bloc, or its defense of human rights against dictators such as Pinochet, Duvalier, or Marcos. That Pino Puglisi, who died as recently as 1993, is the first martyr of the mafia to be beatified is a sad reminder of how the Church often previously sacrificed its moral integrity for reasons of convenience. Yet the fact that the Church ultimately broke its ties with the mafia and gave the world a martyr as impressive as Pino Puglisi is a testament to the fortitude of Christian witness.